Croeso I Ty Ddewi – Welcome to St Davids. We live a slower pace of life here; flat spells are whiled away with windy walks on the cliff tops or spent conversing in the pub around a log burner, drinking fine Welsh ale. With a population of around 1600 we are officially the smallest city in Britain, but despite our modest size we welcome over half a million visitors a year who come for adventure, relaxation and to explore an area steeped in history. St Davids is locked into a peninsula in the heart of the Pembrokeshire Coast National Park. This part of the planet was recently voted the second most outstanding coastal destination in the world by National Geographic and when you arrive, it’s clear to see why. The jaw-dropping coastline to the north and south is blessed with some great surf beaches, dotted with caves, islands, some of the oldest rocks in Britain and magnificent wildlife – not to mention the local wildlife at the Rugby Club on a Saturday night! Pembrokeshire became the UK’s only coastal national park in 1952 and in May 2012 the Wales Coastal Path was opened as the world’s first path to circumnavigate an entire country. Along the 870 mile walk you’ll come through St Davids’ main beach, Whitesands, where, in the heat of summer, there are often around 2,500 beach users enjoying the clean water, rock pools and sandcastle competitions. 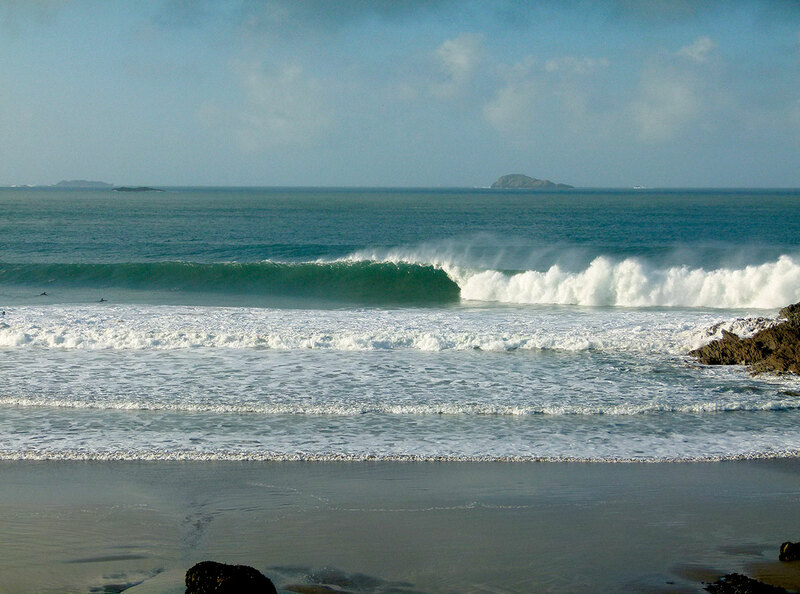 As the beach empties in autumn and the swells start to march in from the Atlantic, Whitesands lights up as one of the most popular surf spots in the area. History: In April 1964 St Davids Surf Lifesaving Club became affiliated to the parent body of the Surf Lifesaving Association of Great Britain. From then on, the Surf Lifesaving facility at Whitesands developed from a bell tent, to a 6 x 8ft garden shed in ‘65, which was destroyed in a huge storm in Sep ‘67, before being replaced by a cattle truck. In ‘68 Solva and St Davids united and formed a joint club, however since there was already a Whitesands SLSC in Cornwall we called ours Porthmawr (Welsh for ‘Big Beach’) SLSC. In the 1970s the lifeguard hut was finally built and heralded the rise of surfing in St Davids, quickly becoming the hub of the social scene for surfers as most of them worked as lifeguards. In 74/75 a local surfer known as Chris ‘Pipeline’ brought goodies from Cornwall including the first HangTen T-shirts, super thick flip flops and purple wax. 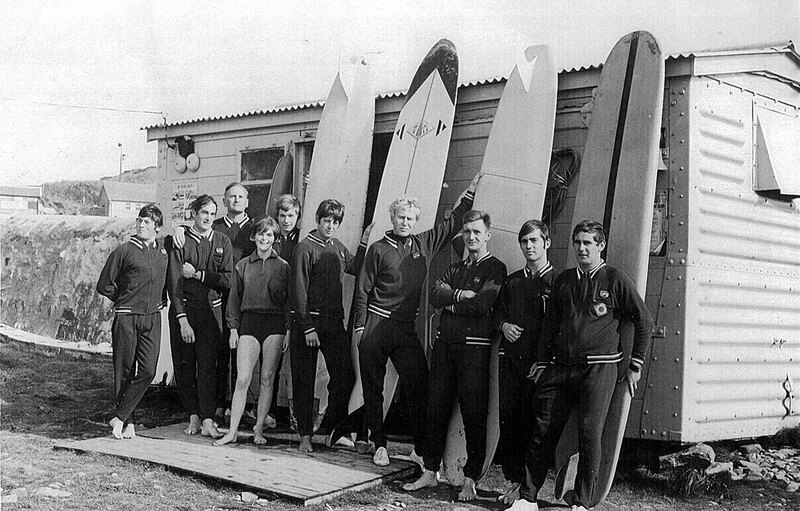 Then, in 1977 ‘Ma’ founded Ma Simes Surf Hut from a shed in her garden at Whitesands. Her idea was to get hold of wax and leashes for her enthusiastic surfing children and their friends, but soon the shed became stocked with surfboards, wetsuits, accessories and clothing, and without any forward planning and almost by mistake, a successful business grew. In the 1980s Ma became a surfing legend at the age of 65, without even managing to get her feet wet! She went on to import Piping Hot wetsuits direct from Australia and moved the shop into the centre of St Davids where Ma Simes surf shop still stands today. The Waves: Whitesands beach is about a mile long with rocky cliffs to the south, sand dunes and a pebble bank in the middle, with a cafe and a car park to the north. The Ram’s Nose is at the north end of the beach and further again is St Davids Head. Looking out from the beach you can see a number of islands including Ramsey. The beach faces west and the prevailing wind is from the south-west so it’s only really when you get an easterly wind that it’s offshore. That said, it is pretty protected from a south/south westerly wind and it’s more sheltered than most of the other surf beaches in Pembrokeshire. With some experience you can use the rip by the rocks to take you out to the line up, but it is important to note that the tidal range here is from three to seven metres and can have a huge impact on the surf. Generally, people surf on the dropping tide in Pembrokeshire rather than on the push as they do in Devon and Cornwall. Warm Gulf Stream water and Atlantic swells generally produce good year round surfing conditions in Pembrokeshire. Whitesands is like any wave that’s your local – you just go in and make the most of it and sometimes you get it really good! Most local surfers congregate at a spot called The Elevator beside the Ram’s Nose. It gets good on a mid to low tide with fast, punchy, top to bottom rights. We wait like tigers ready to pounce and as soon as the dropping tide hits a certain rock you can bet the waves will pick up. Back in the day the old boys would get a newspaper, check the charts and spend their days dossing at the beach until that dropping tide kicked in. Whitesands is great for beginners through to advanced surfers. If you’re just starting out then definitely make the most of the empty waves in the middle or the south end of the beach so you can have plenty of space and more waves to yourself. Local surf schools TYF Adventure and Whitesands Surf School have been teaching surfing at Whitesands since the 80s, so are a good place to start if you’re still finding your feet. Being on a peninsula there are always other beaches to be explored which will have light offshore winds when everywhere else is blown out – you just need to get a map and go adventuring. Newgale is in the middle of St Bride’s Bay. 10 minutes south of St Davids; it’s a flat beach with a long, hard paddle out in waves over 4ft. There are peaks all along the beach, and low or high tide are best avoided; it is a mellow wave that’s less steep than the waves at Whitesands, making it better suited for longboarders. Easterlies and north easterlies are offshore here. The Crew: Over the years there’s always been a talented local crew surfing Whitesands. The true pioneers were Mark Dove, Martin Lawton, Nick Sime, my dad Andy Middleton, big wave rider Tony Kitchell and Alf Alderson, who went on to become one of the first ‘surf journalists’ in the UK, editing Surf magazine and writing the first in-depth guide to surfing in Britain ‘Surf UK’. This early crew were joined by a bunch of guys who surfed waves all around the county like Chris Payne, Reg Goddard, Tim Harvatt, Tim Kitchell, Nobby and Pete Bounds. And some even formed a local surf band called The Decksteppers. “Swell on the Head” was their ‘code 10’ for pulling a sickie at work as it meant there was swell on St Davids Head. Legend has it that Reg would rock up with a stinking dead cow or a pig in the back of his van for roasting on a spit later in the night. The wave itself hasn’t changed much over the years, people still surf the same spot they did five decades ago. These days when the surf is flat you can go coasteering, trekking, kayaking or rock climbing in the St Davids area, but back then when it was flat they would take off skating down Newgale Hill. Tim Harvatt was a skateboard dealer through the American contacts he made at Brawdy army base and managed to get hold of the legendary Green Kryptonics skate wheels from California when they were still like gold-dust. It’s great to see that the first people who ever surfed Whitesands are still out there mixing it up with the new crew today and interestingly many are self-employed giving them the flexi-time that allows for surfing! Some of today’s shredders include Luke Thompson and his brother Stig, Charlie Sime, Ben Phillips, Ryan Thomas, Will Hughes, Tom Luddington, Ross Beese, William Chant who runs the Waterings B&B and many others, too many to mention! Unlike the old days, there’s now a growing handful of styling chicks including Lou Luddington, Vicky Travers, Jetske Germing and me. The culture in St Davids is very welcoming and there’s no localism; everyone talks to everyone and we’re always interested in well-mannered travellers. In the peak of the summer holidays the area does get congested so I’d recommend a visit in the spring or autumn when you’ll often find you have the waves, beach, and coast path to yourself with just a handful of friendly locals to keep you company.